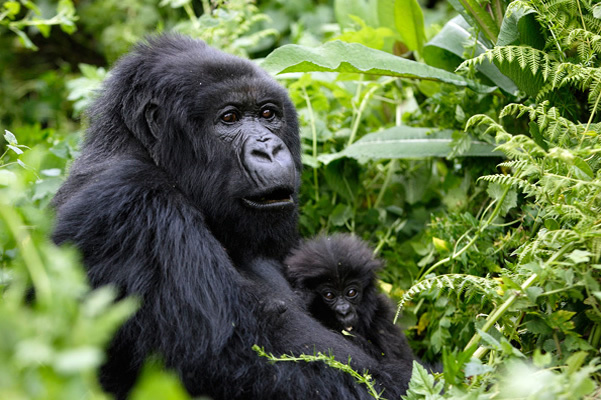 Searching for a 2 Days Uganda Gorilla Trekking Safari from Kigali tour package? Following the 100% increment on Rwanda gorilla permits that saw the price rise from $750 to $1500 per permit for all nationals, we have come up with an itinerary that will let you spend $600 on each permit if you cannot afford the Rwanda gorilla trekking permit prices. Many aren’t willing to take the 9 hours drive to Bwindi Forest National Park or Mgahinga Gorilla National Park that’s why they always opt for Rwanda. However, this 2 days Bwindi gorillas from Kigali safari begins and ends in Rwanda but the actual gorilla trekking activity is in Bwindi Impenetrable National Park in Uganda. Bwindi Impenetrable Forest and Mgahinga Gorilla National Park are just 4 hours away by road from Kigali compared to the 9 hours when you check in from Uganda, which cuts the distance and the price as well. This 2 Days Uganda Gorilla Trekking Safari from Kigali tour will not only save you time but save you lots of bucks too. It is a great option for those that cannot afford the $1500 price tag on Rwanda gorilla trekking permits. On this first day of your 2 Days Uganda Gorilla Trekking Safari from Kigali, a representative together with a guide from our Rwanda tour company will pick you up from the airport or your hotel and take you for a Kigali city tour where you get to visit the Kigali genocide memorial center which commemorates the 1994 Rwanda genocide. On this second day of your 2 Days Uganda Gorilla Trekking Safari from Kigali tour, you will enjoy an early morning breakfast and transfer to the park headquarters with packed lunch for briefing by the ranger guides and later head into the forest for the trek. Gorilla trekking in Bwindi can last anywhere between 2 to 8 hours depending on the movement of the gorillas. On finding them, visitors are allowed 1 hour to view and take photos of these gentle primates and later return to the starting point where a certificate is awarded and meet the driver / guide and transfer back to Kigali with a lunch en-route, arriving Kigali in the late evening, and drop-off at the Hotel or airport for onward flight to mark the end of this 2 Days Uganda Gorilla Trekking Safari from Kigali tour.